Fork & Spoon Records: Fork and Spoon Records: No Way Jose! - No Way Jose! Albums » No Way Jose! » No Way Jose! 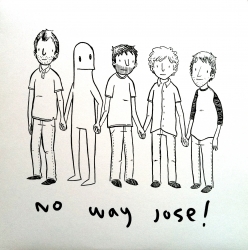 A complete collection of the studio recordings of Columbia, SC's instrumental keytar-driven prog-punk quartet, No Way Jose!. Track 1-9 come from the debut full-length titled "Mormie In The Monitor" while tracks 10-14 chronicle the bits and pieces that appeared on various compilations and collections. This 12" vinyl record includes a No Way Jose! coloring and activity book drawn and designed by Sam Spina!